Why Does a Carpet Stain Keep Coming Back? If you’re reading this, you’re already probably frustrated with that carpet spot you’ve been working on but the carpet stain keeps coming back. As a professional carpet cleaning company, we understand your frustrations. Sometimes even for the pros, as much as we hate to admit it, a carpet stain keeps coming back. Almost always, the answer to this problem lies not in the carpet itself, but in the carpet pad. Carpet pads are kind of like a big sponge. They are typically a porous foam material. The structure of carpet is such that fibers are effectively glued onto a carpet backing during manufacture. This leaves plenty of porous holes where liquid (or oil or grease) can seep through. When a substance penetrates through the carpet fibers and the backing and then into the carpet pad, the “big sponge” traps the substance in it, and beneath it. Usually this problem is more common when there is a large amount of something spilled. For example dog urine, dropping a full cup of coffee, a plate of greasy chicken wings, and so on. When an effort is made to clean up whatever caused the spill, there may be initial success in getting the spot to lift. However, as it dries, the carpet fibers wick the staining substance back into them. Soon, what looked like a successful spot clean up, is back to looking terrible. What’s the Solution to Carpet Spots That Keep Coming Back? Once again, the answer lies in the carpet pad. If you can’t get the spilled substance out of the carpet pad, the spot is never going to go away. Most of the time, if you have a spot that keeps coming back, it’s time to call in the pros. The answer to the problem lies deeper than your home spot cleaner is going to be able to clean. There are three professional level options to deal with reappearing spots and stains. Carpet cleaning reoccurring spots is typically where we start. Sometimes a good thorough cleaning will provide enough “oomph” to get the spot out. 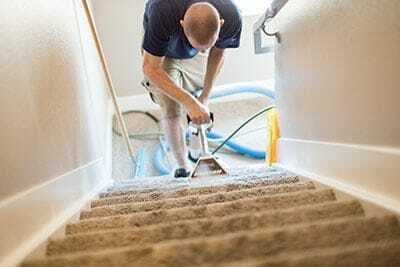 We can then apply a product called an encapsulant that will seal any remaining stain from coming back up through the carpet backing into the fibers. For something that doesn’t have an odor, sealing in the spot with an encapsulant after cleaning can be a viable option. On rare occasions, we do get called back to a customer’s property when the stain reappears the next day, however. I know what you’re thinking… I don’t mean an actual flood. What we refer to as “flooding” means that we take a bucket of solution and apply it to the stain. This has to be specific to what we’re trying to remove. Pet urine carpet cleaning, for example, requires a different solution than a spilled tray of greasy chicken wings. The idea here is that we want to fully saturate the spot with something that will break it down. For the chicken wing example, that’s probably a powerful citrus-based degreaser. For pet urine, it’s going to be a pet specific product that neutralizes odors and eliminates color. Once this solution has gone to work for an adequate period of time, we use a flood water extractor (just like we’d use on soaked carpet) to extract the water, cleaning solution, and whatever is left of the stain. For the worst carpet stains that keep coming back no matter what you try, we usually opt to replace a piece of the carpet pad. For this carpet repair to be done, we’ll first pull back the carpet and clean it while it’s not pressed against the pad. Next, we’ll cut out the affected area. Sometimes it’s also necessary to seal the subfloor with a special paint. Normally subfloor sealing is only needed for things like pet urine removal, with cat urine being the number one perpetrator. Finally, we replace the piece of padding we cut out with a similar piece with the same density and thickness and we reinstall the carpet. Lastly, we stretch the carpet back into place. Another potential cause of a carpet stain coming back is residue that has been left in the carpet. There are many kinds of residue. For example, a low cost, low quality carpet cleaning company may only rinse the carpet with water, leaving behind a soapy residue that attracts soil. Another case may be if you used over the counter carpet cleaning spray and didn’t thoroughly rinse it. A more fringe case, but one we still run into, is where people read online that using WD-40 on their carpets is a good idea. Yes, it is a solvent. It will break down some spots, like removing slime from carpet. However it leaves mineral oil behind in your carpet that turns into a dirt magnet. 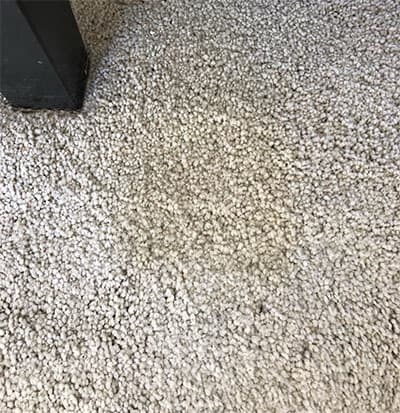 This can make it look like the stain reappeared and make you feel like the stain keeps coming back when it’s actually a “fresh” stain attaching to residue left in the carpet. It’s always a disappointment to customers when we have to inform them that what appears to be a stain is actually permanent damage to their carpet caused by wear and tear. Worn out carpet can often have the appearance of looking “dirty”. Traffic lanes are the places in your home or business that get walked on over and over. Hallways, turns around a couch in the living room, or the spot your feet land when you sit down in your favorite arm chair to watch TV every night for 5-10 years. These spots may actually be dirty as well, and will clean up to some extent, however the only cure to create new looking carpet in these spots is to either patch the carpet (which can be tricky trying to patch new carpet into old carpet), or replace the whole carpet to achieve a uniform look. 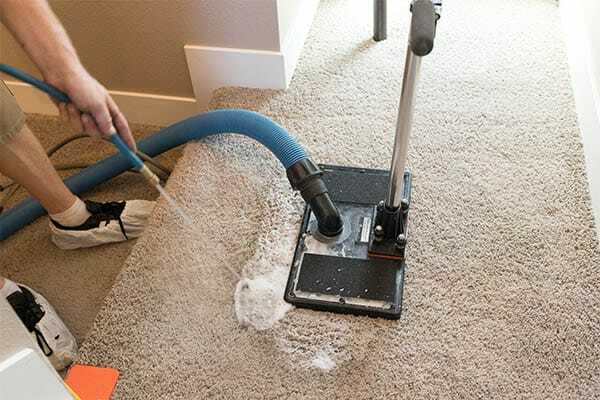 Sometimes during a professional carpet cleaning (or even a DIY carpet cleaning), when the carpet is wet, it will look like the problem has been solved. Once it dries, though, there are those pesky traffic lanes again. Need Help Getting Rid of Spots That Keep Coming Back? If you are in or around Denver and need professional assistance getting rid of those stubborn reappearing carpet stains, give us a call. We’ve tackled just about every kind of stain you can think of. Even those rare stains that can’t be removed can be patched with a different piece of carpet. Regardless of your carpet cleaning or carpet repair needs, trust the pros at MSS Cleaning.